The details behind our ideal microclimate. Our therapeutic environment is possible thanks in large part to our halogenerator, a specialized device that grinds pure, pharmaceutical-grade salt into micronized particles that are small enough to be breathed into the respiratory tract. The state-of-the-art, feedback-regulated tool also maintains the optimal dry salt aerosol concentration in the air throughout each session. To complete the replication of a natural salt cave, our ventilation system and in-floor radiant heating keep a consistent temperature range of 70 – 75°F and a humidity level of 40% – 50%. Salt-covered walls and a warmed floor covered in mineral-rich Dead Sea Salt boost the negative ions and antimicrobial properties of the cave, which increase its beneficial effects. At the end of each session, the air is completely vented for 15 minutes before being replaced with fresh air for the next therapy session. 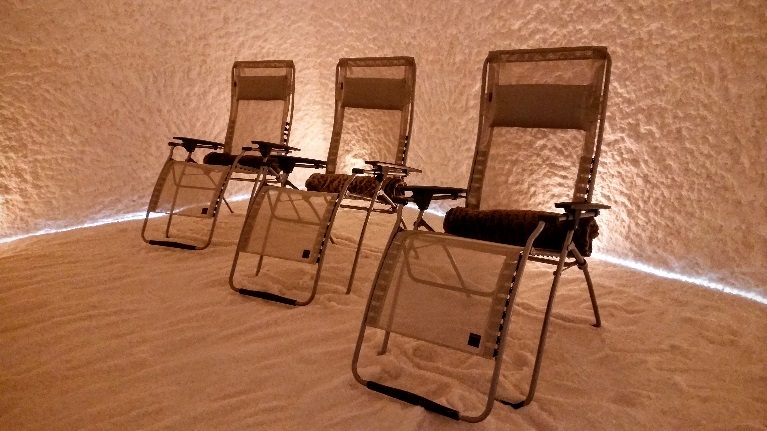 The salt cave is 400 sq. feet, allowing 8-10 guests to be seated comfortably.